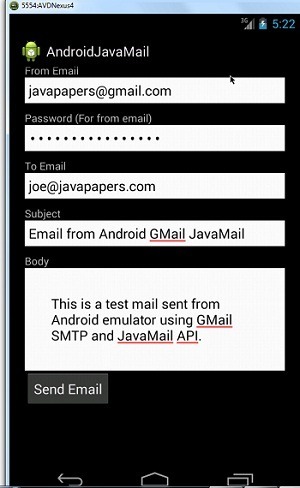 Sending email using an Android app, which we custom build using with GMail SMTP using JavaMail API will be fun. With respect to using GMail’s SMTP server to send email is simple and easy to do. Code for the component of sending email in Java platform and Android app are same. Jars used from JavaMail API will be different for Java platform and Android, but the code we write will be same. I already wrote a tutorial for sending email using Java and GMail SMTP with JavaMail API. Refer that for understanding about the core service of sending email. It has got couple of steps only and easy to understand. Here in this Android tutorial, we will reuse that same code which used to send email using GMail from Java. Remember we cannot use the same Jar files that we used from JavaMail API, but we need to use the ported version of JavaMail for Android. As far as GMail provides its SMTP server for our use, we can enjoy it for free like this, thanks to Google. We should have an email id created from GMail. This Java class is not specific to Android and can also be used in general Java SE platform by using the general JavaMail API jars. Constructor sets the basic required JavaMail parameters and configuration settings for GMail SMTP. Constructs the MimeMessage using which the email will be sent. Sends email using Transport API. In our example, this is the default Android Activity for the Android app. This is the email compose screen, when we start this example app we will just directly land in the email compose page. It will have the basic email fields like, from, to, subject, body. We can give the from email address and its respective password as input argument. This example app uses above GMail.java class to send email which comes with default settings that is configured for sending email with GMail SMTP. So if you want to use any other SMTP server, then we have to update the smtp settings there. I have used AsyncTask, as sending email is best done in a separate thread. SendMailActivity will receive the user email arguments and pass it on to the SendMailTask to send email. SendMailTask interacts with GMail.java by passing parameters to and publishing mail sending status using ProgressDialog. Android Manifest has got the usual configuration and we need to add an extra line. This is for giving permission for our Android app to access internet to send email using GMail. I have not provided the dependent JavaMail jars with the project source code download below. You need to download jars mail.jar, activation.jar and additional.jar from JavaMail-android download page. Create a folder named “libs” in the Android project root folder and paste these jars in it. Comments on "Android Email App with GMail SMTP using JavaMail"
Are you publishing android apps. I hope if you do, they will be great. Thanks for this tutorial but i am confused about the Password thing. Is it actual gmail account password? if a runtime exception is thrown in the finalize method The exception is simply ignored and the object is garbage collected. Thanx for the code.But I am getting Force Close whan I click on Sendmail.Please give me suggestion to solve the problem. Thanks Joe, this works perfectly for my app. Hi Joe, this is a fantastic tutorial. But I am having an issue. similar to this one. How do I do that? Please help! Very informative; Thanks for sharing. How we can use UTF8 for sending other language? Last two lines showing error. and not working . I am getting Force Close whan I click on Sendmail.Please give me suggestion to solve the problem. Thanks for this tutorial is very useful. I have a question, if you could answer I would really aprecite it. I follow this tutorial and create an application, but the problem is that it works normally in my Android 2.3 cell. But in my Lenovo A3300 Android 4.2.2 tablet don’t send the message LogCat says that cannot be connected to smtp 587 port. Need more information to resolve this. Check for information in LogCat, we should find out why its not able to connect to smtp port. thanks for a very nice tutorial. I have a question though. Why do we need to use the javamail-android port? Are there some problems with the standard javamail implementation on Android? My only concern is that the last version is from September 2009. Thanks A lot You save me .. 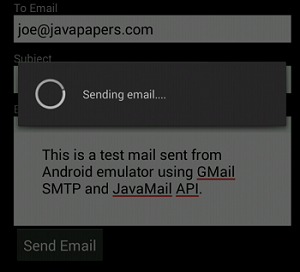 Comments are closed for "Android Email App with GMail SMTP using JavaMail".